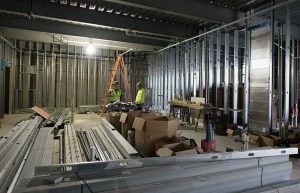 Interior work is rolling along. 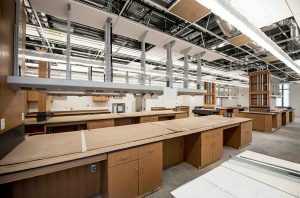 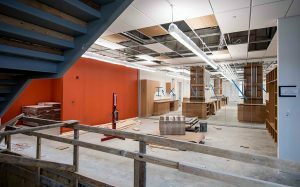 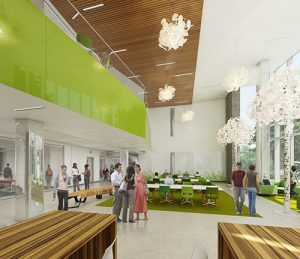 Lighting and cabinetry are being installed in some of the lab spaces, walls are getting some vibrant splashes of color, and the two-story glass “tree house” is as breathtaking inside as it is out. 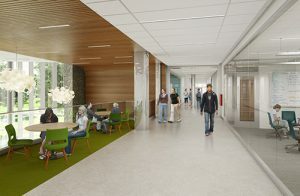 Knowlton Commons on the second floor, made possible by a generous gift from the Austin E. Knowlton Foundation, is sure to become a popular gathering spot for students from every discipline, not just the life sciences. 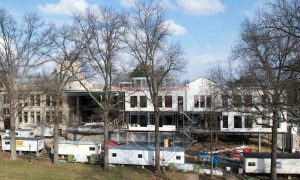 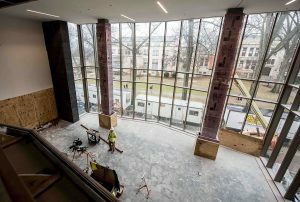 A two-story “bay window” projects out from the building, providing a great view up the campus mall toward Kauke Hall. 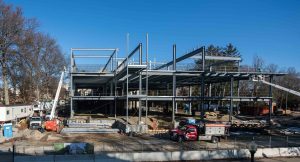 On Friday, the final steel beam for Williams Hall was lowered into place. 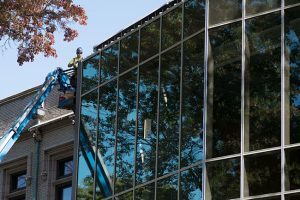 Following long-established construction tradition, an evergreen tree and and American flag were fastened to the beam before it was raised. 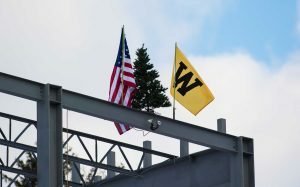 And since this is a College of Wooster project, it seemed only appropriate to flank the tree with another banner as well.